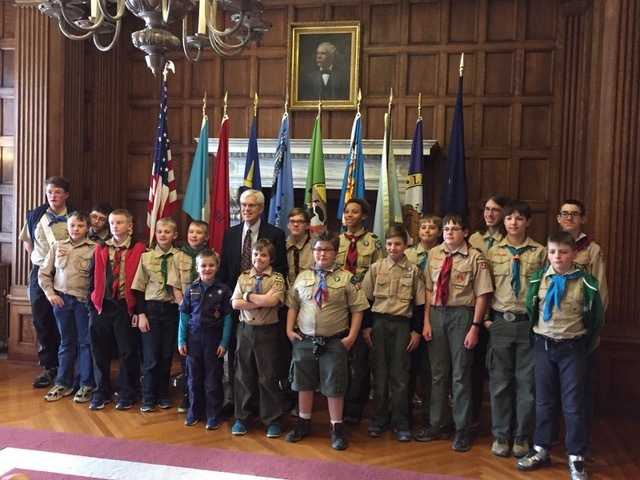 Troop 26 of Black Eagle, MT | An Active and Fun Boy Scout Troop in Black Eagle, MT! The lights are going off a week from tomorrow. All across the USA, millions of people will experience a full Solar Eclipse of the sun. The last solar eclipse in this area was 1979, and the last solar eclipse that could be viewed all over the US was in 1918. To an experience an eclipse is a rare event in your lifetime. Troop 26 will be going to Camp Buffalo Bill in Wyoming to get a better view of the eclipse. In preparation (and for those of you that can’t join us), we will be learning about this astronomical phenomena at our Scout meeting tomorrow evening, 7pm at the Black Eagle Community Center. Please bring a shoebox and a yardstick to the meeting for some of our activities. We will be building an eclipse viewer and modeling the eclipse. Scouting Baby Shower for the Adams Family! Jeremy and Annette Adams have been volunteers with our troop for almost FIVE years now. In addition to being an incredibly active Assistant Scoutmaster, Jeremy has also been a member of our District Training team and has just stepped up to help out with the Scouting for Food drive. Well, they have some great news. Annette is expecting a baby boy, their first. Troop 26 is organizing a baby shower for Jeremy and Annette for this coming Sunday, March 5 at 3pm at the YWCA of Great Falls, 220 2nd Street North. Please feel free to join us! If so, please bring a dessert to share. They would like to develop a library of children’s books. OA Elections and Sustainability MB on Monday! I hope that you are all having a great Scouting week! We will be continuing work on Sustainability Merit Badge at our meeting coming up on Monday, February 27 at 7pm at the Black Eagle Community Center. Please make a point to bring the worksheets from our last meeting and complete what you can in the homework we discussed at our meeting on February 6. In addition, we will be holding elections for new eligible members of the Order of the Arrow at our meeting on Monday. We have several eligible candidates for the order, but we can only hold an election if at least half of our registered youth members attend the meeting. Please make a point to attend the meeting on Monday so that we can induct new worthy members of the Troop into Scouting’s Honor Society. We had a great turnout at the District tours of the Montana legislature last week. Thank you to the Scouts that attended and the adults that accompanied them! Please bring your first aid kits to our meeting tonight. We will be having a hands-on first aid review as our program at our meeting tonight, 7pm at the Black Eagle Community Center, 2332 Smelter Avenue. Be prepared to act as a team and to think quick, using all of your first aid skills. We will be reviewing first aid skills found in your Scout handbook, so be sure to bring that also! Classes are now available for Merit Badge University! Check out https://meritbadgeu.wordpress.com/mbu5-offerings/ for a list of classes that will be offered at MBU, which will be March 31-April 1 at Carroll College in Helena. Course registration is this coming weekend, so please bring a list of the top five classes you want to attend at MBU to the meeting tonight. This year there will be a lottery for Robotics MB, so it is possible that some of you will be able to attend that class. Again, please remember to bring the list of the top FIVE merit badges you want to take at MBU to the meeting TONIGHT. We will also need your attendance commitment for MBU tonight so that we can get you registered for classes. February is always a busy Scouting month. Please mark your calendar for all of these events! Scouting’s birthday is next week, beginning with Scout Sunday on Sunday, February 5. If you wear your uniform to church on Sunday you will be eligible for a Scout Sunday patch. Please let me know if you qualify and we will get you your patch. Our first Scout meeting of the month will be Monday, February 6. Patrol Leader’s Council will be at 6pm and our general Scout meeting will begin at 7pm, both at the Black Eagle Community Center, 2332 Smelter Avenue. Please make a point to attend PLC if you have a leadership position in the Troop. Our Scouting theme for the month is Sustainabililty, and we will be working on the (Eagle-required) Sustainability merit badge this month, led by our own Assistant Scoutmaster Dave Cunningham. Saturday, February 11 is our Troop ski day at Showdown. We will be announcing more information about this event on at the meeting on Monday, but we hope you will attend and have a great day at the slopes. If you want to go skiing, I need to hear back from you right away so that I can get you signed up for the right options. If you need to rent equipment, you will NEED to fill out a rental form at our meeting on Monday. Please call or text me at 406-868-8982 as soon as possible if you will be going Skiing with the troop. We will have a Scout meeting on Monday, February 13 at 7pm at the BECC. We will continue working on Sustainability merit badge. On Monday, February 20 we will be joining the District for Scout day at the Montana Legislature! This is a great opportunity to meet your elected representatives and find out how our laws are made in Helena. This event will give you the opportunity to qualify for many advancement opportunities. If you plan on going to Helena for this event, please get back to me as soon as possible so that we can arrange the right transportation. There will be no Scout meeting on February 20 as that is President’s Day and there is no school. Our final Scout meeting for February will be Monday, February 27 at 7pm at the BECC, where we will hopefully finish up with Sustainability merit badge. Thanks for reading this long email and marking your calendars. Have a great Scouting month! The VFW Scout of the Year. Some of the VFW’s earliest ties to the community involve youth groups and perhaps none are stronger or more lasting than the relationship between the VFW and America’s scouting organizations. In fact, VFW’s partnership with the Boy Scouts of America dates back to 1915 when VFW Post 2100 helped to establish Troop 1 in Everett, Washington. Through the VFW’s Scout of the Year program, members of the Boy Scouts who display standout citizenship, patriotism and love of country have the opportunity to be rewarded with college scholarships of up to $5,000. No need to wait until the date line in March. Send applications as soon as possible. As the State VFW Scouting Chairman I am not part of the selection committee. A selection committee will be formed of other VFW state and Post officers. How to apply? : Scouts should download and submit a completed VFW Scouting Scholarship form, resume of high school activities, scouting record, community service record and letters of recommendation to your local VFW Post no later than March 1. Use the attached list of Montana VFW Post. Contact the person on the list first to confirm the address. If they sound unfamiliar with the program, don’t worry. Have them contact Post 209 in Missoula, they are familiar with the program. We haven’t had much luck in the past with Scouts applying. Last year we had no applicants, the year before only 2. So, I urge you to apply. Don’t wait to the last minute . I hope that you all had a great holiday break! I also hope that you are prepared for a truly great Scouting year in 2017! We will get back in the swing of things with regular meetings that will resume this coming Monday, January 9. Patrol Leader’s Council will be on January 9 at 6pm the Black Eagle Community Center, 2332 Smelter Avenue followed by our Troop Meeting at 7pm, same location. The topic of our next few meetings will be preparation for the Klondike Derby. MSGT Goff from Malmstrom will be teaching CPR to Troop 1026 on Friday, January 13 at 4:30pm at the Black Eagle Community Center. As this course is free, it will be impossible to give a CPR certificate for the class. However, this training will fulfill all requirements for merit badges such as First Aid, Lifesaving, etc. If you would like to participate, please RSVP as soon as possible so that MSGT Goff can bring the correct amount of CPR dummies. At a minimum, all Scouts that do not yet have First Aid merit badge should make a point to participate. Well, that’s about all for now! I look forward to Scouting with all of you in 2017! Our troop Christmas party and Court of Honor is tomorrow at 6 PM at the Black Eagle Community Center, 2332 Smelter Ave. I hope you are all looking forward to a great time. Many of you will be earning merit badges, awards, and ranks of achievement — I look forward to seeing you all there. As always, our troop Christmas party is a potluck dinner. The trolls will bring a main dish and a salad or side dish; the Panthers will bring a main dish and desert. We will also be having a white elephant gift exchange at our Christmas party! If you want to participate, please bring a wrapped gift worth no more than $15. What fun! With the beginning of winter break it will be several weeks before our next meeting. Please use this time to prepare for the rapidly approaching Klondike Derby campout. Your patrol leader should be in touch with you for a patrol meeting to prepare during winter break. I hope you are enjoying December! I am loving the return of our Montana winter. Our big Christmas party and Court of Honor is a bit more than a week away, on December 19 at the Black Eagle Community Center at 6pm. Please bring your Scout book to our meeting tomorrow, December 12 at 7pm at the BECC. At our Scout meeting tomorrow, we will be reviewing each of your progress to your next rank. If you are ready, we will give you a Scoutmaster conference and Board of Review at our meeting tomorrow so that you can be presented with your rank at the Christmas party. Please review your rank progress today and do what you can to complete your next rank!